Zabaglione - sounds fancy, doesn't it? Simply put, it's a delightfully light egg and alcohol custard. Deceivingly easy to make, the required constant whipping creates tiny bubbles that give this custard its light and airy 'foam' texture. There are many versions of Zabaglione but traditionally it's a dessert made with Marsala and often served with fruit or spooned over a cake. Because this is a Recipe Swap, how could I stick with a dessert version? Savory ideas from cheese to spicy pepper meandered through my mind, yet the idea of a sweet custard would not stop interfering. A Pumpkin Liquor sent by great friends as a Strange Ingredient gave me the inspiration and base for this recipe. Imagine a Pumpkin Zabaglione with a hint of maple dripping down the side of buttery golden brown french toast. Plus Dave loves french toast and I've been forcing him to eat a lot of healthy dishes this past week, so it will be the perfect surprise breakfast. The recipe below will make more than you need for the french toast unless you double the amount of toast you make. Fold a little whipped cream into any remaining zabaglione and freeze it for a simple semifreddo (soft ice cream). This rich, delectable custard is a wonderful french toast topping, and would pair well with fruit too. If you haven't made or tried a zagablione, give this Fat and Happy version a try. Then peruse all of my fellow Recipe Swappers' recipes via the links below while you are savoring the rewards. Fat and Happy Food Blog Tips and Techniques: The Recipe Swap takes an recipe from a recipe book from days gone by and recreates by changing at least 3 items and/or the method. See more information at the Recipe Swap page. Since you will be busy whisking, start the french toast first and keep them warm in the oven. Serve immediately when the Pumpkin Maple Zabaglione is ready. Create a double broiler by placing a bowl over a soup pot. The bowl should form a decent seal around the top of the pan and should be only about half the depth of the pot. Pour about 2 cups of water into the pan and let it come to a simmer. In the bowl whisk together all the ingredients. Place the bowl over the simmering water, be sure the bottom of the bowl doesn't touch the water. Whisk the mixture until it becomes thick, pale and frothy. It will double or triple in size and you will be able to form ribbons in the custard when it is ready. Remove from heat. Spoon the zagablione over the french toast. Savor every bite. While a griddle or large flat pan is heating, whisk together the eggs, cream, vanilla and cinnamon. Add a pat of butter to the pan, dip the bread slices into the egg mixture and place on the hot, buttered griddle. Cook until golden brown then flip and repeat on the other side. Stack a few french toast slices onto a plate with a small pat of butter; then drizzle with the Pumpkin Maple Zabaglione. Serve while warm. *If you don't have or can't find the Pumpkin Liquor, try amaretto or brandy instead. Monique I have not even heard of Pumpkin Liqueur nor would I have had the vision to incorporate it here! What an interesting, delicious and seasonal twist to this dessert. Nicely done! Strange - and awesome - ingredient! As always, it's so fun to read your posts! That looks awesome, and I especially love your idea for semifreddo. I'll definitely have to try that soon. Pumpkin and maple huh...love! I love making a decadent French toast; I seldom have much of anything for breakfast so when I do, I like a treat. This would qualify! Great inspiration, I was trying to think of something "not dessert" with this swap and ended up sticking with a dessert anyway. Your post looks delicious. Mmmmm, French toast... with pumpkin... looks divine! I love this twist on the original recipe! I like your version waaaayyy better than the original! French toast will win me over any day! Great swap! 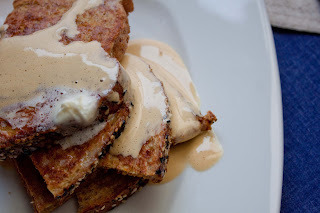 French toast topped with the maple zabaglione makes me wish I was there at your breakfast table! I love the idea of making a semifreddo from the leftover zabaglione! Nice job adapting this one. I am not a breakfast fan but this would have me saddling up to the table right quick. Yes, French toast imbued by various flavors RULES! I have no clue that anything like Pumpkin Liqueur existed, but I bet it's divine in a custardy concoction like this one! Could this be any better? I love French Toast, and I had no idea that one could have pumpkin liqueur in one's life, but now I need to make it happen in mine. Love love love it. This looks fantastic. I've never heard of pumpkin liquor either, but I would happily give it a try! Wow. 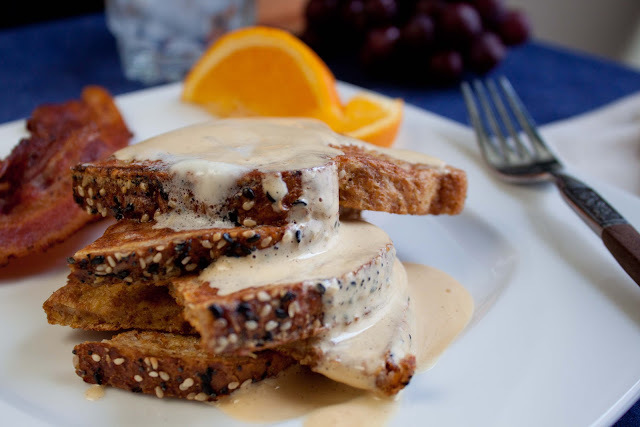 What a brilliant idea to top French toast with zabaglione. And I love the pumpkin aspect of it too. Sounds so nice and warm on a cold winter weekend morning!